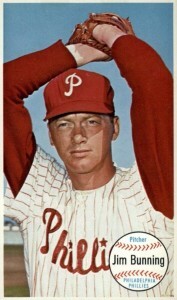 Jim Bunning, known for his remarkable ability to strike-out batters with an impressive slider, became the ace pitcher for both the Detroit Tigers and Philadelphia Phillies rotations over his 17 seasons in the league. Later joining the Baseball Hall of Fame, Bunning would have an equally long and impressive career as a politician representing the state of Kentucky in Congress. Fans of Bunning from either side of his two different career paths can take advantage of this top list that brings together his best baseball cards over his entire playing career. 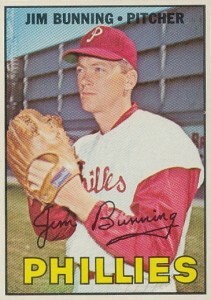 Shop for Professionally Graded Jim Bunning Cards on eBay. Although Bunning only won 20+ games in a season once, he was still able to finish his career with an impressive 224 wins. While compiling those victories, Jim Bunning had several moments of absolute perfection as he notched a perfect game in 1964, pitched another no-hitter, and threw an "immaculate inning," which is the rare feat of striking out the side on nine pitches, all of them strikes. After his retirement from baseball, Bunning turned his attention to politics and was elected to the U.S. House of Representatives. He would later become a U.S. Senator for two terms and served in that capacity through 2010. There are a few cards honoring Bunning's service in Congress including a base card in the 2009 Upper Deck Prominent Cuts set. Collectors interested in expanding their Jim Bunning collection beyond this top list can focus in on the many statistical leader cards he shared with some remarkable pitchers. In 1968 Topps, fans can find a Strikeout Leaders card he shares with Fergie Jenkins and Gaylord Perry. The N.L. 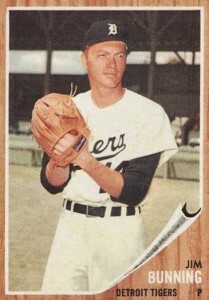 Strikeout Leaders card in the 1967 Topps set includes Bunning and Sandy Koufax on the same piece of cardboard. 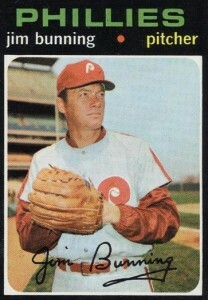 In 2003 Topps Gallery, there is a beautifully painted Jim Bunning card documenting his time with the Phillies. A rainbow of different Bunning parallel cards can be collected in 2012 Panini Cooperstown and collectors can find his base cards with the 1983 Topps design in 2015 Topps Archives. In building this list, value is a key component but scarcity and design was also considered in determining Jim Bunning's best baseball card appearances. Click in the images or listings to shop for cards on eBay. 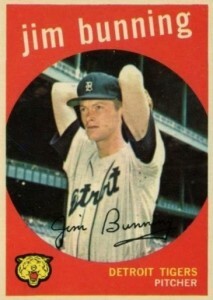 Bunning's last card as a player can be found in the iconic black-bordered 1971 Topps set. He returned to the Phillies for the final two seasons of his career before retiring at the end of the 1971 season. Fans who enjoy the black borders of the 1971 set can also find a black-bordered Bunning card in the Topps Greatest Moments set - also from 1971 - which features a card honoring his no-hitter and perfect game. The tall size of the 1964 Topps Giants set lends itself to some great portraits that the regular base cards have trouble capturing. During his time with the Phillies, Bunning was a workhorse and twice led the National League in games started. 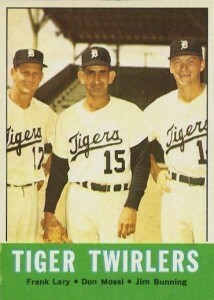 Jim Bunning shares his "Tiger Twirlers" card from 1963 Topps with his Detroit Tigers teammates Frank Lary and Don Mossi. While Lary and Mossi did not regularly reach the level of dominance Bunning did, they did occasionally achieve their own moments of greatness. 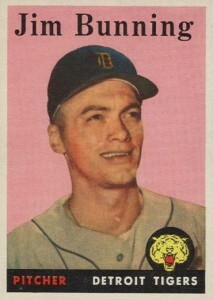 Mossi went 17-9 during the 1959 season and Lary was 23-9 during the 1961 season, making them both popular Tiger pitchers. The reverse side of Bunning's 1961 Topps reminds us that he led the league in strikeouts in 1959 and 1960. He also did it one more time in 1967. At the time of his retirement, Bunning was in second place all-time in strikeouts only behind the great Walter Johnson. Although this card comes ten years after his rookie card, Bunning's 1967 Topps card, in highly graded condition, can become his overall most valuable card at auction. This is due to his card #560 being in the very scarce, high-numbered series in one of the most popular sets of the 1960s. After picking up Bunning's framed 1962 Topps card, collectors can also track down his appearance in the oddball Baseball Bucks set that Topps issued the same year. The Bucks were basically green currency bills with the player's face replacing Washington, Lincoln, or Hamilton. These unique cards came in individual packs for one penny each. 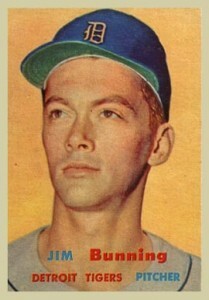 Jim Bunning's 1959 Topps card is about as close as you'll get to an action photo on a card from the 1950s. Although his posed windup doesn't look too imposing, when Bunning was really on the mound his side-arm pitching motion would throw his body nearly onto the dirt of the pitching mound after delivering the pitch. Budget-minded collectors can pick up Bunning's second-year card from 1958 Topps at quite a bit lower price than his prized rookie card. This card's reverse side highlights his first great season when he went 20-8 and led the league in innings pitched. Bunning has been signing exclusively with Panini over the past few years and if you are in the market for a licensed certified autograph, you'll need to go back a few years. The 2005 Upper Deck Sweet Spot Classic set offers a Phillies-era Bunning autographed card while the 2004 Sweet Spot set offers a similar card with a Tigers photograph. 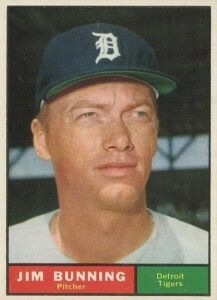 Although he pitched for the Tigers in 1955 and 1956, it wasn't until 1957 Topps that Jim Bunning made his baseball card debut. In a set that is famous for its key rookie cards, Bunning's card does get overlooked, yet his premier appearance is still able to command prices over $200 for nicely graded copies.